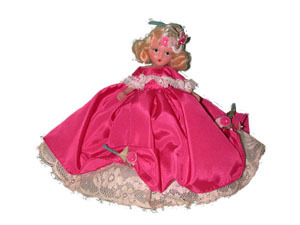 This site was designed to help enhance the enjoyment of collecting Nancy Ann Storybook Dolls from the 1930s and 1940s. Collectors will find the history of the Nancy Ann Storybook Doll Company, help in identifying Nancy Ann Storybook dolls and the characters they represent, and dolls for sale. Be sure to see the Photo Album for lots of pictures of Nancy Ann Storybook Dolls. We also buy dolls. Please browse and enjoy! ©2001-2011 by Keri Lynn Dolls - All rights reserved. We are not affiliated in any way with Nancy Ann Storybook Dolls, Inc.